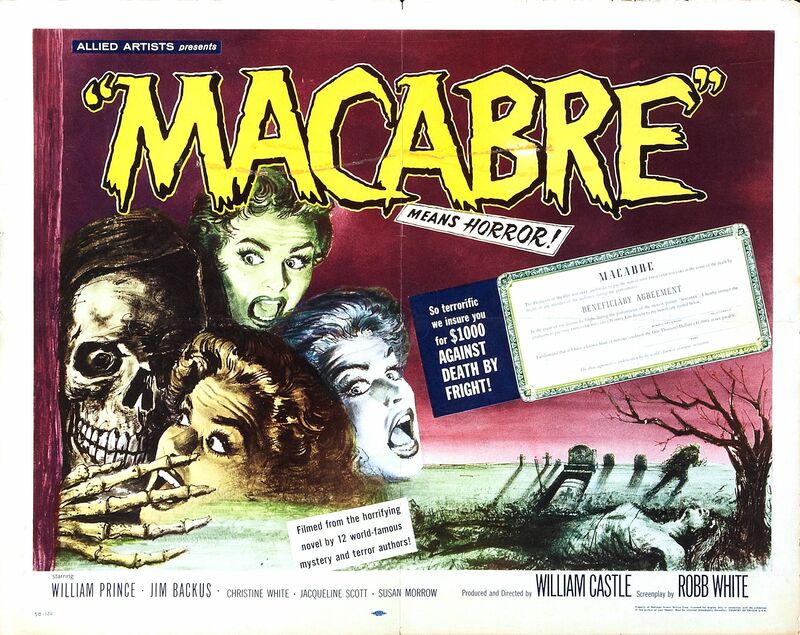 Cinema Sunday: Macabre (1958) | Magazines and Monsters! 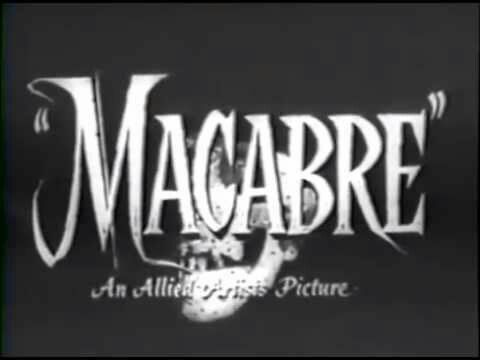 The film begins with a funeral parlor director giving a statement to the sheriff (Jim Backus, yes, from Gilligan’s Island!) about how his establishment was broken into. He tells the sheriff that it was a child’s coffin, but the sheriff seems to think the man is probably trying to pull an insurance scam to pay off gambling debts. He then sees a man get out of a car across the street, and you can tell he’s got bad intentions towards the man. 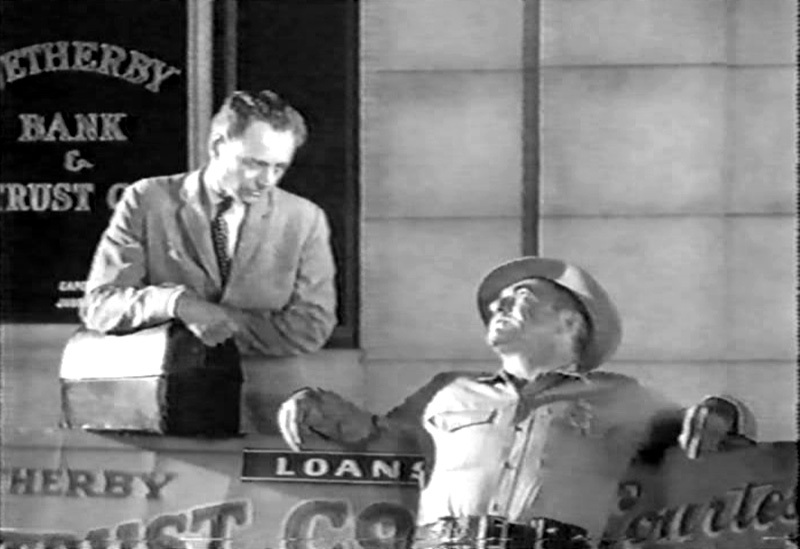 We are then introduced to Dr.Rod Barrett (William Prince), as he’s verbally accosted by the sheriff, who seems to have it in for him. Why? Because apparently the Doc won the affections of a woman who the sheriff also loved (Alice, the Doc’s wife who died). The sheriff advises him to get out of town, but the Doc tells him to get lost, then heads inside to his office. Inside the office, we meet the Doc’s secretary, Polly Baron (Jacqueline Scott). She’s prettying herself up for the Doc, as she seems to be smitten with him. He enters the office and she lights up like a Christmas tree. They talk briefly about the sheriff, but the Doc (with Polly in-tow) eventually heads out and to his home. Once there, he looks for his daughter, who was with his girlfriend all afternoon, but returned home safely. The nanny, Miss Kushins (Ellen Corby), informs him that his daughter is probably just hiding, and that’s why he can’t find her. He frantically searches for her, but to no avail. He thinks maybe she’s gone back to his girlfriend’s house, so he heads over to her place. 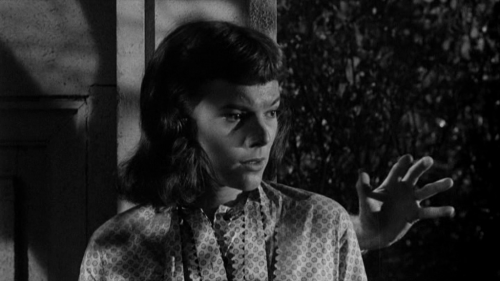 He arrives but she’s not there either, and he has a brief conversation with Sylvia Stevenson (Susan Morrow), but returns home quickly. Just before he reaches his home though, the telephone rings. Polly answers, rushing in front of the nanny. She gets a horrified look on her face, and then begins screaming at the caller. The Doc rushes in, and asks her what’s going on. She tells him that the unidentified caller told her that the Doc’s three-year old daughter has been kidnapped, and buried alive. They only have a few hours before she runs out of air, and dies. Polly, the Nanny, and the Doc are trying to piece together this insane assault on his family, but cannot figure it out. 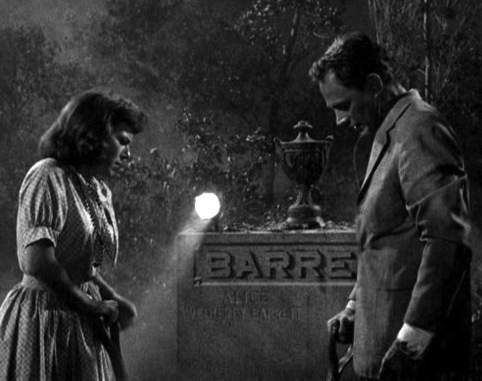 The Doc thinks she must be buried in the graveyard, so he and Polly head over there to try to find her. Meanwhile, the nanny goes to the grandfather (the Doc’s father-in-law), to inform him of the incident, even after the Doc requested she not tell him due to a bad heart condition he has recently acquired. She tells him what’s going on, and you can tell by his demeanor that he’s not going to take this lying down. Over at the graveyard, Polly and the Doc are still trying to piece this together while searching the area. They seem to feel like they’re being watched, and Polly tells him numerous times that she heard and saw something in the brush nearby. They see a fresh grave, so they begin digging. A few minutes in, and the Doc realizes it’s a ruse. They then head over to a crypt of the family’s but it’s so full of cobwebs, you know it hasn’t been disturbed in years. They get surprised by the grave keeper, but explain to him they’re not grave robbers. Jode Wetherby (the grandfather, real name Philip Tonge), surprises the grave keeper, and accidentally kills him. Polly rushes him back to the Doc’s house, where he accuses the nanny of possibly being the abductor. Is it the nanny, the sheriff, or another enemy of the Doc or Wetherby family? Find this movie and get the answers to this riddle! This is one film for the time that was pretty morbid and outlandish. 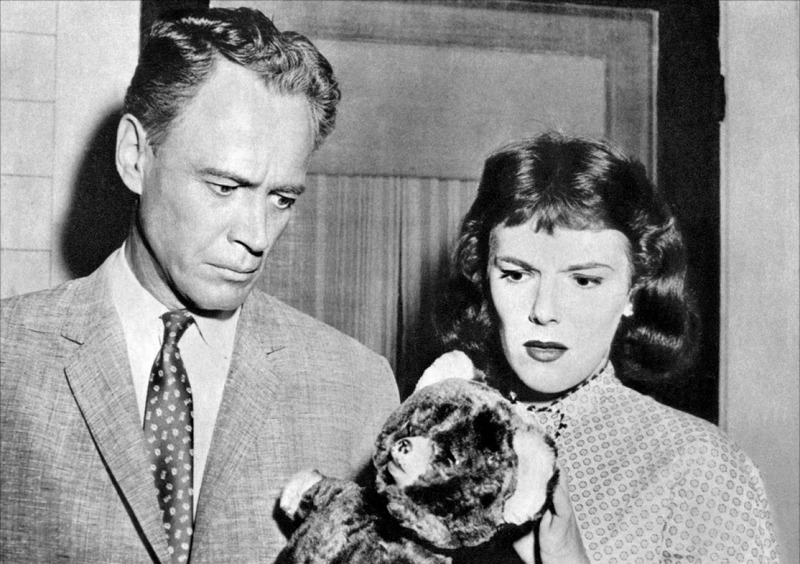 Think about it, the year is 1958, and most of us weren’t even in a dream in momma’s head yet. William Castle can be called nothing less than a revolutionary in the film industry. Yes, most will remember him for the gimmicks (this film had one- an insurance policy because you might die of fright! – image below), and rightly so, but dig deeper, and watch these films, and you’ll see the substance is there. Believe it or not, Jim Backus plays an incredible heel in this film. Most will remember him as Thurston Howell III, from Gilligan’s Island, of course, but put that role out of your head, because this is nothing like that show. William Prince does a good job portraying a tortured soul, and the frantic father. The supporting cast is above average, and we get a great mystery with a few red herrings to throw you off the scent. A couple of beautiful starlets are a treat as well (images below)! Get out there and find this flick, you wont regret the time spent watching this thriller!